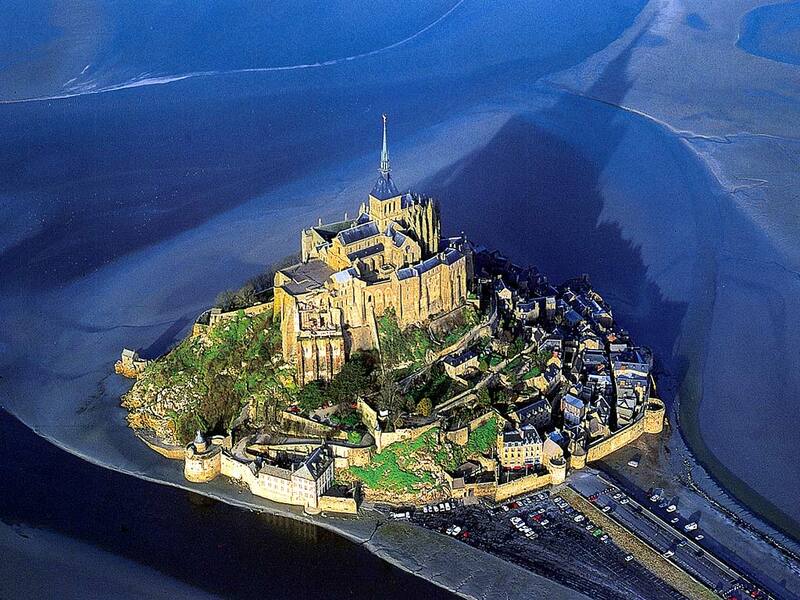 Mont Saint-Michel is a rocky tidal island and a commune in Normandy, France. It is located approximately one kilometre (just over half a mile) off the country's north-western coast, at the mouth of the Couesnon River near Avranches. The population of the island is 44, as of 2009. The island has held strategic fortifications since ancient times, and since the 8th century AD been the seat of the monastery from which it draws its name. The Mont-Saint-Michel and its bay are part of the UNESCO list of World Heritage Sites. More than 3,000,000 people visit it each year. Mont Saint-Michel was previously connected to the mainland via a tidal causeway, i.e. a trackway covered at high tide and revealed at low tide. This connection has been altered over the centuries. The coastal flats have been polderised to create pasture, thus the distance between the shore and the south coast of Mont-Saint-Michel has decreased, and the Couesnon River has been canalised, reducing the flow of water and thereby encouraging a silting-up of the bay. In 1879, the tidal causeway was converted into a raised or dry causeway. This prevented the tide from scouring the silt around the mount. 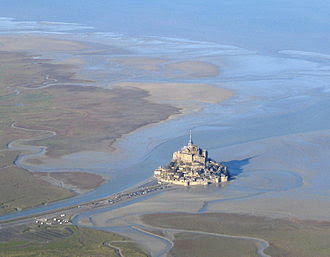 On 16 June 2006, the French prime minister and regional authorities announced a €164 million project (Projet Mont-Saint-Michel) to build a hydraulic dam using the waters of the river Couesnon and of tides to help remove the accumulated silt deposited by the rising tides, and to make Mont-Saint-Michel an island again. It was projected to be completed by 2015. The construction of the dam began in 2009 and is now complete. The project also included the removal of the causeway and its visitors car-park. It will be replaced by a light bridge, allowing the waters to flow freely around the island, which will improve the efficiency of the now operational dam, and a replacement car-park on the mainland. Visitors will use small shuttles to cross the future bridge which will still be open to pedestrians and unmotorised vehicles. 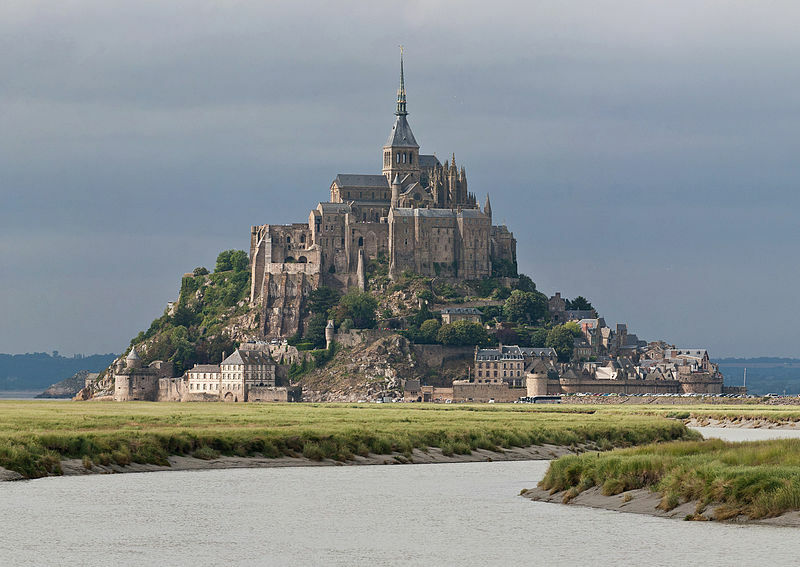 Mont-Saint-Michel was used in the 6th and 7th centuries as an Armorican stronghold of Romano-Breton culture and power, until it was ransacked by the Franks, thus ending the trans-channel culture that had stood since the departure of the Romans in AD 460. Inside the walls of Mont-Saint-Michel. Before the construction of the first monastic establishment in the 8th century, the island was called "monte tombe". According to legend, the Archangel Michael appeared to St. Aubert, bishop of Avranches, in 708 and instructed him to build a church on the rocky islet. Aubert repeatedly ignored the angel's instruction, until Michael burned a hole in the bishop's skull with his finger. The mount gained strategic significance in 933 when William "Long Sword", William I, Duke of Normandy, annexed the Cotentin Peninsula, definitively placing the mount in Normandy. It is depicted in the Bayeux Tapestry which commemorates the 1066 Norman conquest of England. Harold, Earl of Wessex is pictured on the tapestry rescuing two Norman knights from the quicksand in the tidal flats during a battle with Conan II, Duke of Brittany. Norman Ducal patronage financed the spectacular Norman architecture of the abbey in subsequent centuries. 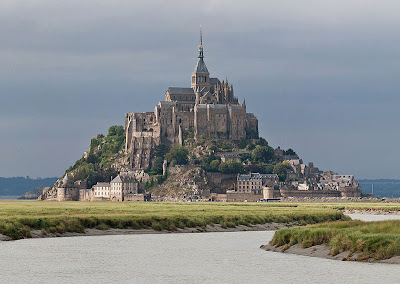 In 1067, the monastery of Mont-Saint-Michel gave its support to duke William of Normandy in his claim to the throne of England. It was rewarded with properties and grounds on the English side of the Channel, including a small island off the southwestern coast of Cornwall which was modeled after the Mount and became a Norman priory named St Michael's Mount of Penzance. The wealth and influence of the abbey extended to many daughter foundations, including St Michael's Mount in Cornwall. However, its popularity and prestige as a centre of pilgrimage waned with the Reformation, and by the time of the French Revolution there were scarcely any monks in residence. The abbey was closed and converted into a prison, initially to hold clerical opponents of the republican régime. High-profile political prisoners followed, but by 1836, influential figures – including Victor Hugo – had launched a campaign to restore what was seen as a national architectural treasure. The prison was finally closed in 1863, and the mount was declared a historic monument in 1874. 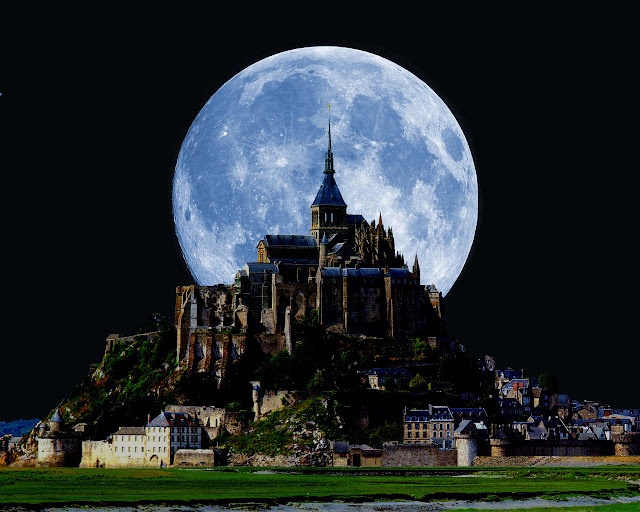 The Mont-Saint-Michel and its bay were added to the UNESCO list of World Heritage Sites in 1979, and it was listed with criteria such as cultural, historical, and architectural significance, as well as human-created and natural beauty.